Purchase tickets to Ain’t Too Proud online, at the theatre box office, or by calling 212-239-6200. The Shuberts conceived of the Imperial Theatre, their 50th New York City venue, as a home to musical theater hits, and their dream has been realized many times over. The playhouse was constructed as a replacement for the Shubert’s 20-year-old (and out-of-date) Lyric Theatre. 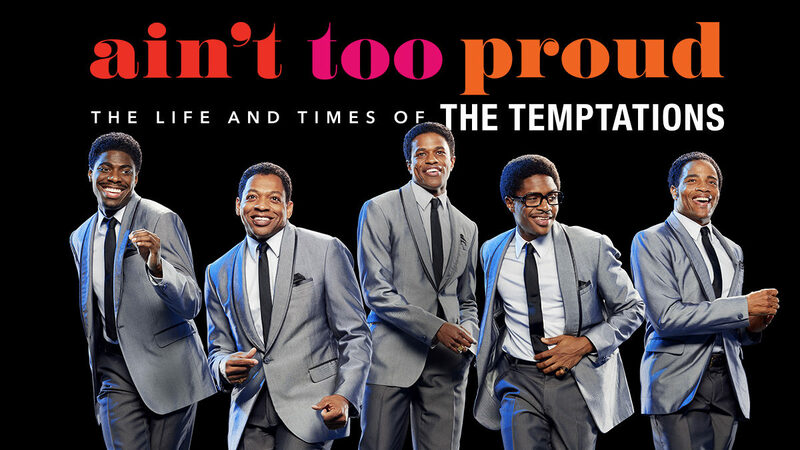 Ain’t Too Proud: The Life and Times of The Temptations is the next show playing at the Imperial Theatre. The Imperial Theatre has 1,457 seats and is one of the Shubert Organization‘s 17 Broadway theatres. Ain’t Too Proud is recommended for ages 13 and older. Children under the age of 4 will not be permitted in the theatre. There is a wheelchair-accessible restroom (unisex) located on the main level. Additional restrooms are located up one flight (23 steps). The theatre is not completely wheelchair accessible. There are no steps into theatre from the sidewalk. Please be advised that where there are steps either into or within the theatre, we are unable to provide assistance. Mezzanine location: Located up two flights of stairs on the second level (23 steps). On the Mezzanine or Balcony level, there are approximately two steps up and down per row. Entrance to Front Mezzanine is behind row F.
Reservations are not necessary. A driver’s license or ID with printed address required as a deposit. Please e-mail [email protected] or call: 212-582-7678 to reserve in advance. The Imperial Theatre provides at least 10 infrared assisted-listening devices for every performance at the theatre. Beginning four weeks after a show’s official opening-night performance, at least 10 audio description devices are available for every performance at the theatre. In addition, there is unlimited access to downloadable audio description software for personal mobile devices, available beginning four weeks after a show’s official opening night performance, which provides an automated detailed account of the visual of the production, free of charge, for blind or partially sighted patrons. The theatre also offers handheld devices and software that provide captioning for deaf or hard-of-hearing patrons, available beginning four weeks after a show’s official opening-night performance. Additional devices can be available with at least 24 hours’ notice by contacting Shubert Audience Services at 212-944-3700 or [email protected]. There is also a representative at the Shubert Audience Services kiosk at every performance to assist any patron with the audio description devices, software, or captioning devices. 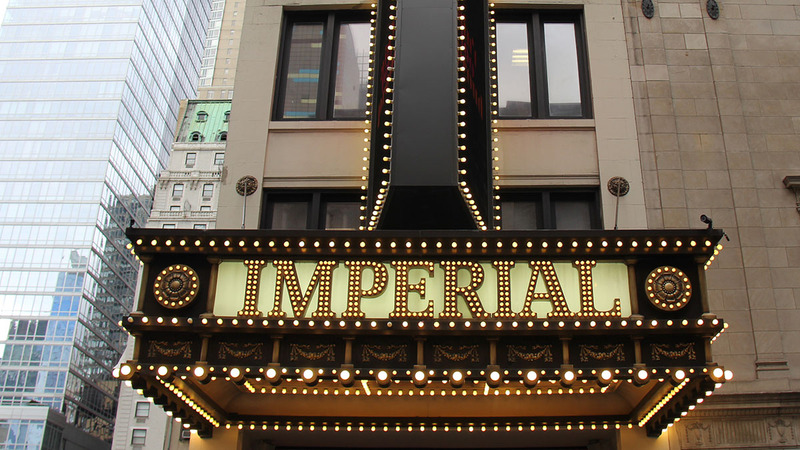 The Imperial Theatre has been one of the most successful theatres on Broadway since its opening in 1923. The 50th theatre built by the Shubert Brothers in the New York area, it is still owned by the Shubert Organization. Its most recent shows have been Carousel; Natasha, Pierre and The Great Comet of 1812; the second revival of Les Misérables (and when it ran here for 13 years after moving from the Broadway Theatre in 1990); 700 Sundays; Nice Work If You Can Get It; Billy Elliot: The Musical; August: Osage County (which moved to the Music Box in April 2008); Coram Boy; High Fidelity; Dirty Rotten Scoundrels; The Boy From Oz; Les Misérables (which ran here for 13 years after moving from the Broadway Theatre in 1990); Jerome Robbins’ Broadway; Chess; The Mystery of Edwin Drood; and Dreamgirls. In the 1970s, Pippin played here and won five Tonys. In 1977, Liv Ullman starred in Eugene O’Neill’s Anna Christie. That was followed by Neil Simon’s Chapter Two and his musical with a score by Marvin Hamlisch and Carole Bayer Sager, They’re Playing Our Song, starring Robert Klein and Lucie Arnaz (Lucie’s father, Desi, had appeared here in 1939 in Rodgers and Hart’s delightful musical Too Many Girls). Other 1970s shows: Shelley Winters in Minnie’s Boys, a musical about the Marx Brothers; Two by Two, a Richard Rodgers–Martin Charnin musical starring Danny Kaye; and revivals of On the Town and Lost in the Stars. During the 1960s, Ethel Merman’s megahit Gypsy moved here from the Broadway Theatre; Carnival! won a Tony for Anna Maria Alberghetti; and Oliver! won Tonys for its score (Lionel Bart), conductor (Donald Pippin), and sets (Sean Kenny). In 1964, Fiddler on the Roof won nine Tonys and played here for two years before moving to the Majestic. In 1967, Cabaret transferred here from the Broadhurst. Musicals continued to be the major fare in the 1950s, with Peter Pan starring Jean Arthur and Boris Karloff and with a Leonard Bernstein score. This was followed by Ethel Merman winning a Tony in Call Me Madam, the Irving Berlin/Lindsay and Crouse musical. Wish You Were Here, with a Harold Rome score, ran for 598 performances. Cole Porter’s last musical, Silk Stockings, also scored a hit, and John Murray Anderson’s Almanac with Hermione Gingold, Billy De Wolfe, Harry Belafonte, and Orson Bean was one of the last lavish revues on Broadway. Frank Loesser’s The Most Happy Fella, Lena Horne and Ricardo Montalbán in Jamaica, and Dolores Gray and Andy Griffith in Destry Rides Again were all delights. Some past glories: Ethel Merman in Annie Get Your Gun (1946); Mary Martin’s debut in Cole Porter’s Leave It to Me (1938); Leslie Howard in Hamlet (1936); Rodgers and Hart’s On Your Toes (1936); Cole Porter and Moss Hart’s elegant Jubilee (1935); Clifton Webb, Patsy Kelly, and Vilma and Buddy Ebsen in Flying Colors (1932); and three great operettas — Babes in Toyland (1930), The New Moon (1928), and Rose-Marie (1924).